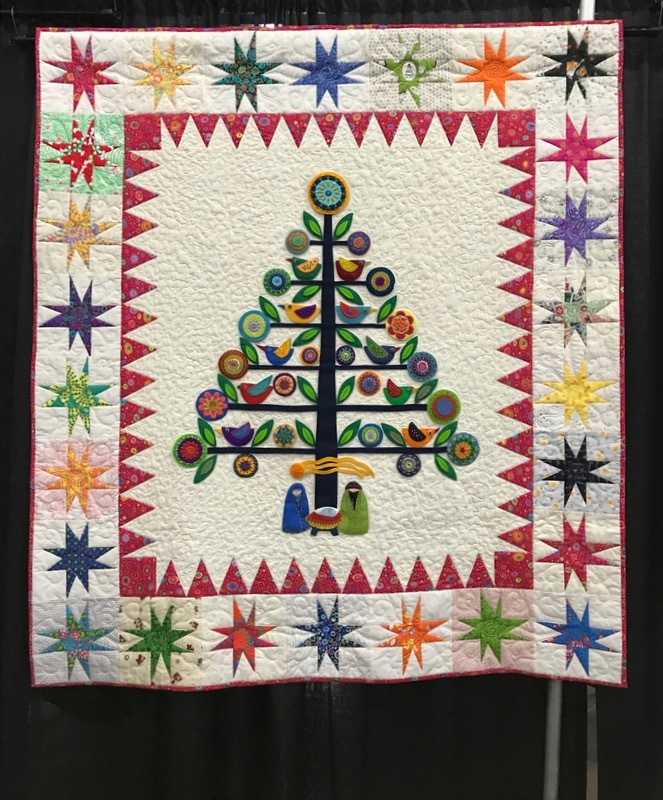 Road to California 2018 | OccasionalPiece--Quilt! Posted on January 26, 2018 by Elizabeth E.
Tuesday: Cynthia England’s class with Lisa, my pal, who has moved away to Utah. That’s Cynthia’s class sample, above. 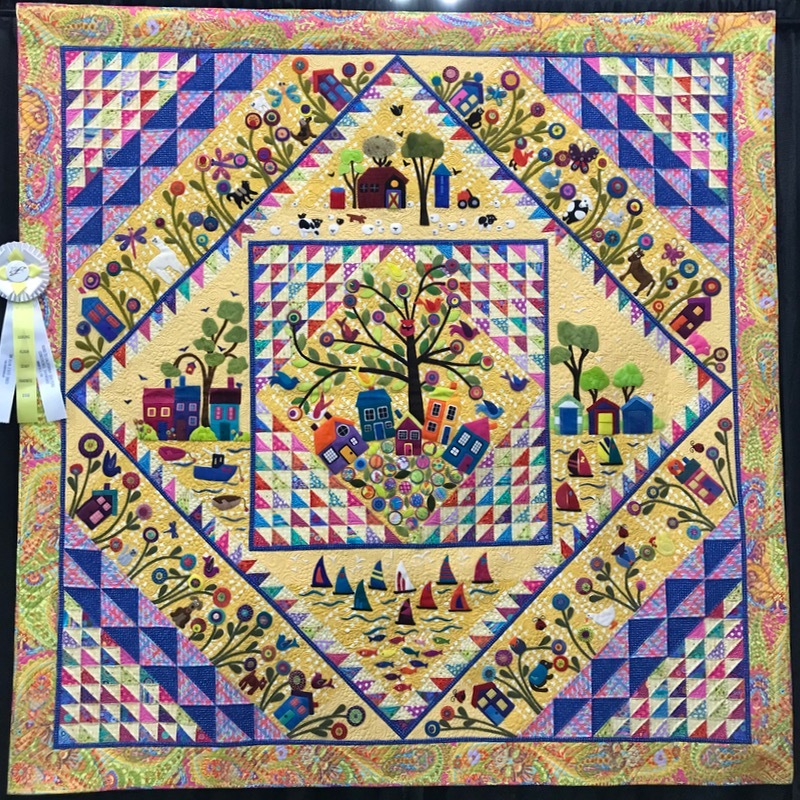 I loved taking a class with Cynthia as I was there in Houston the year her quilt won the Best of Show and launched her career. Upshot? Here’s another UFO for my collection, but I’m glad I took the class and learned the technique. Wednesday was a day off: I picked up my new glasses, blocked a quilt I’m working on for Paintbrush Studios’ booth for QuiltCon in a month, cleaned the house, and did the laundry. 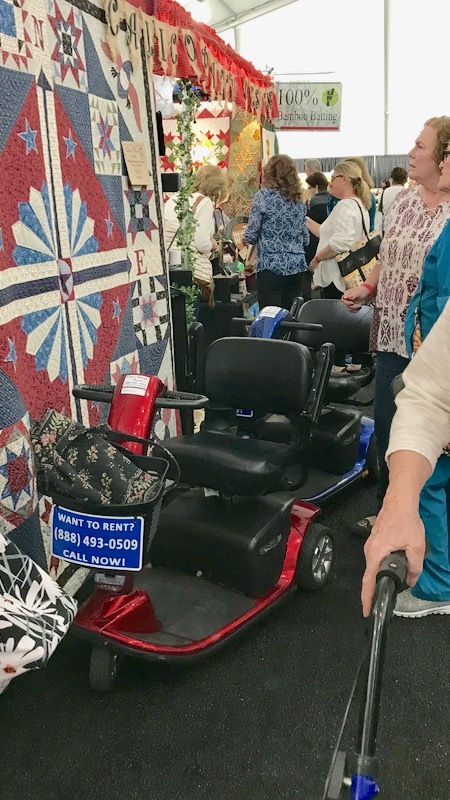 Thursday: I went in early with Leisa, another pal, and killed time until the show opened, and when it did, made a beeline to find my two quilts. Here’s Shine hanging in its cubby with a dazzler gem quilt, which quite overshadowed it. 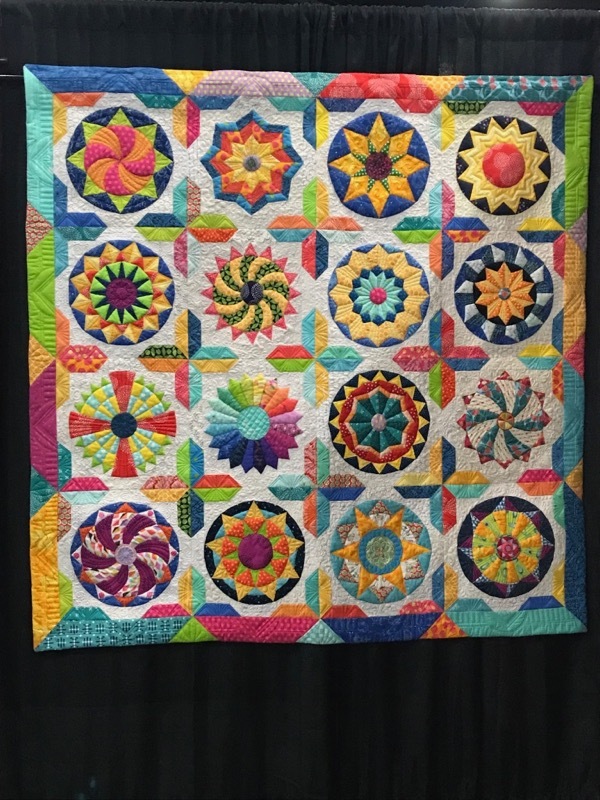 (See below for the link to Instagram, where I did post a lot of the quilts and their names/makers.) But the fun was being juried into Road! Then to find the second quilt: Oh! Christmas Tree, hanging with its buddies. Again, a real thrill to see it there. Now to tackle the shopping. The layout, above. 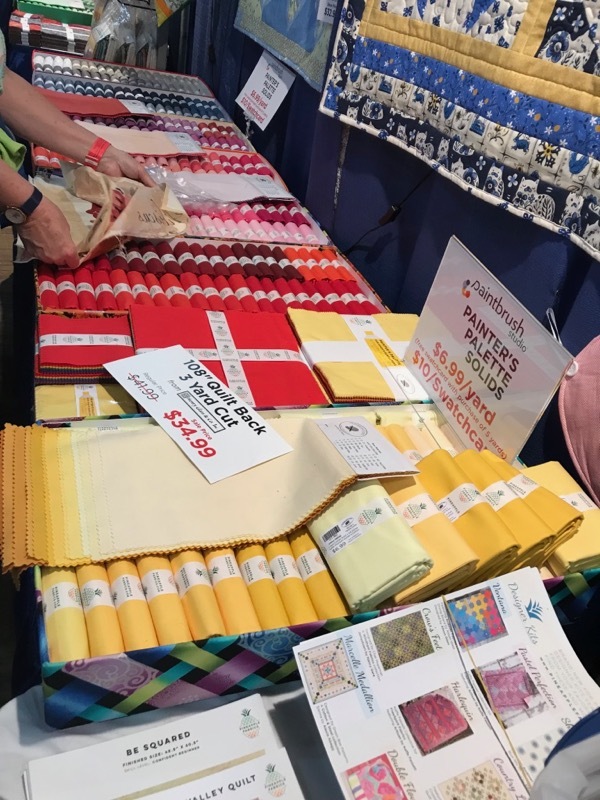 First stop, Pineapple Fabrics, where they stock my favorite solid fabric: Painter’s Palette Solids, by Paintbrush Studio. Even though I learned about these solids by designing a quilt for Paintbrush Studio, I’m quite in love with their solid fabric and needed a few colors. 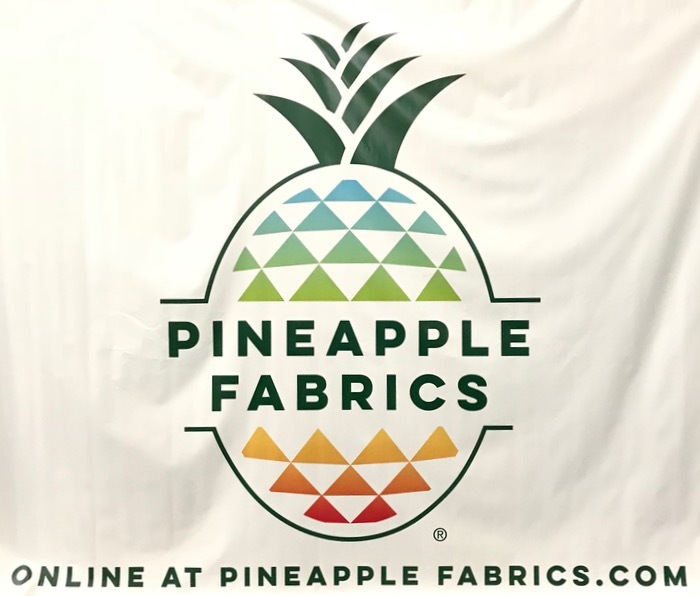 Pineapple Fabrics sells them at the best price of anyone out there. After Pineapple, I started out in the “Pavillion” which is really just a monster-sized commercial tent with awkward lighting. The first row facing the courtyard was well-lit (above, a Kaffe booth that has a great selection), but as soon as you round that corner, the booths are less well-lit. 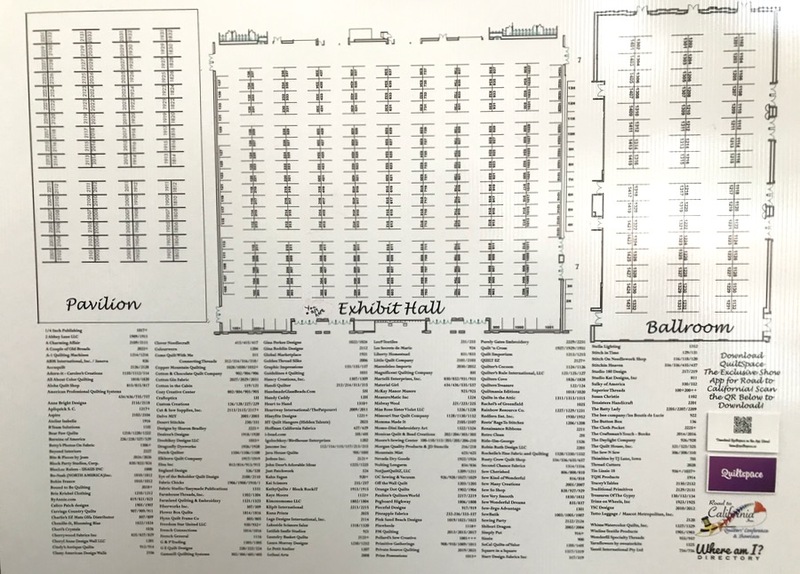 Actually I found the lighting overall to be a problem in the main ballroom, too. It was fine in the small ballroom. Turn up the lights, Road! 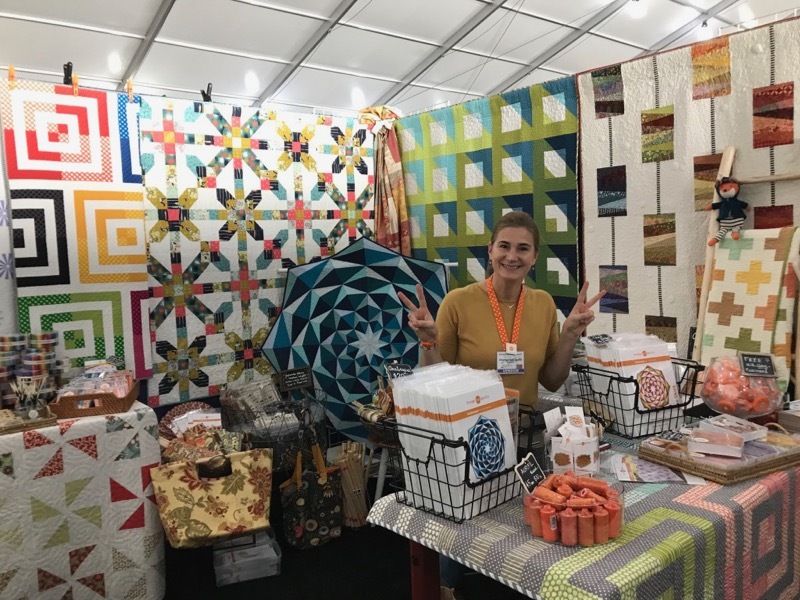 I zipped over to see Dora Cary of OrangeDot Quilts, as I follow her on Instagram, and love her work. For some reason, this show seems to attract the scooter/walker/cane crowd. At the entrance they have about 40 of these scooters lined up to rent. Here are some scooters parked alongside a booth. Will I stop coming to these when I hit this stage? Who knows, but I am counting on the fact that the online presence will be so strong that I can stay home and hit the vendors that way. 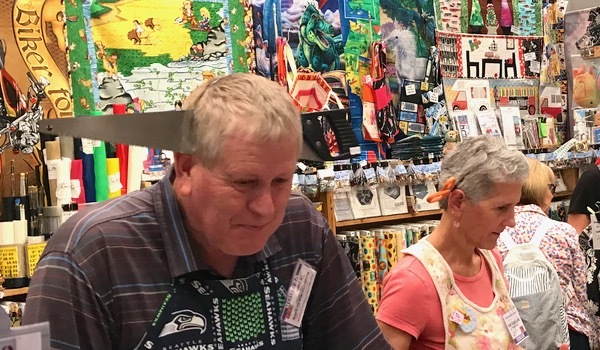 Here is “saw-though-the-head” and “scissors-through-the-head.” I also saw “hairbrush-through-the head.” I suppose, as a vendor, you’ll do anything to make your booth stand out. 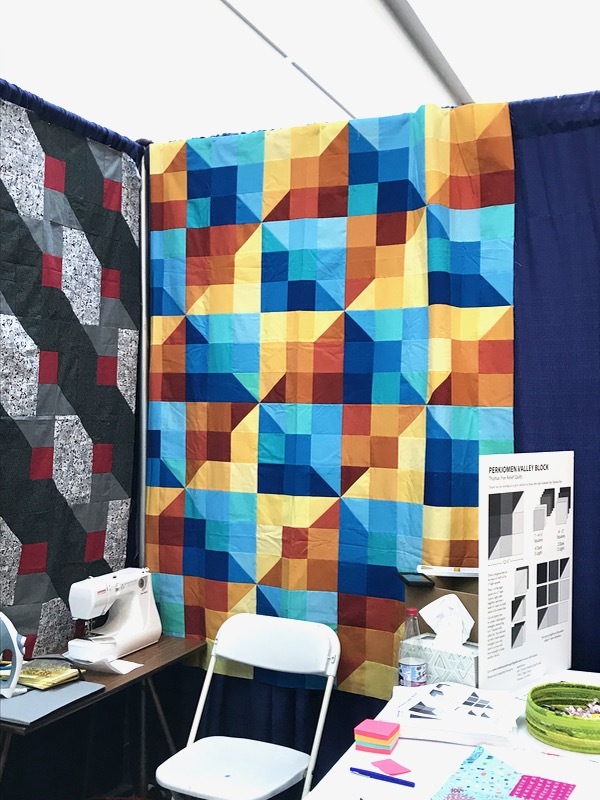 Fun to see a bee-mate’s quilt hanging up in the Ventura Quilt Guild’s booth. 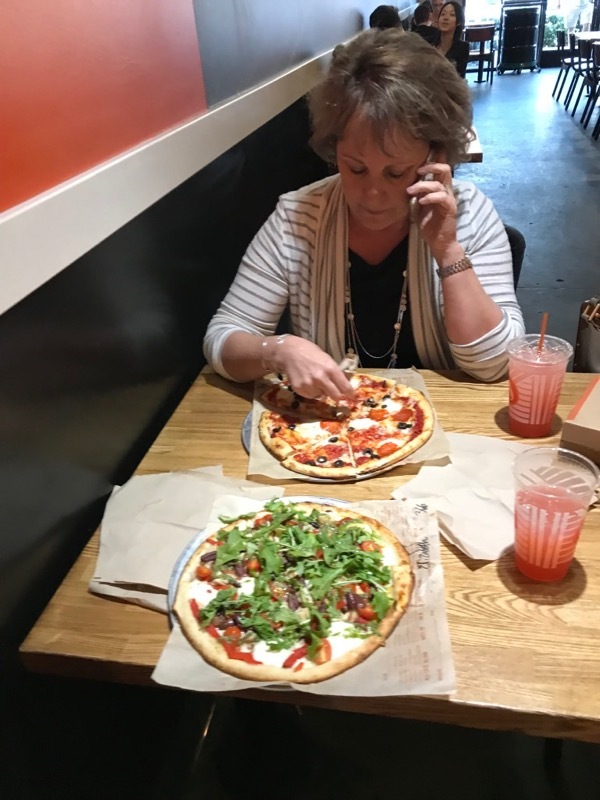 It looks great, Joan! 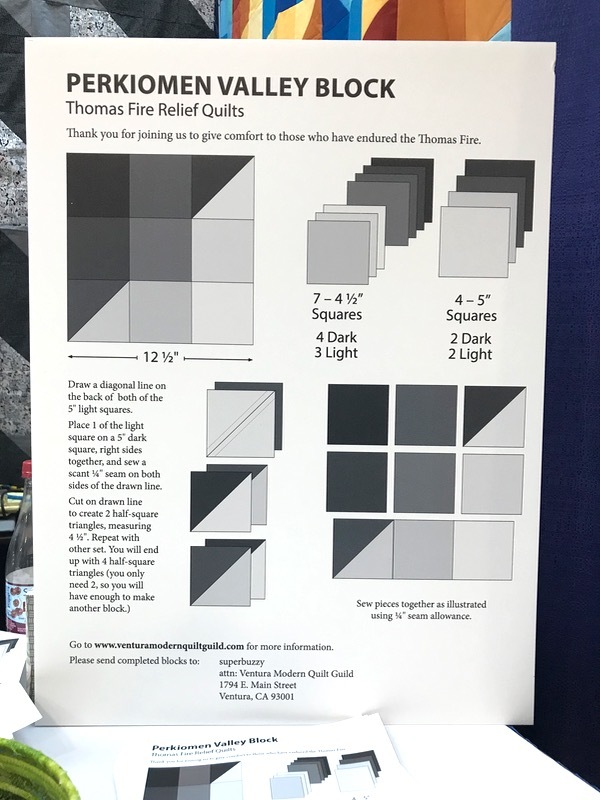 And here’s the instructions and the place to send the blocks if you want to contribute to the Thomas Fire Relief Quilts. I didn’t just shop or take classes (more coming up), but I also took time to look at the quilts. The one made from a Wendy Williams pattern (above) caught my eye. 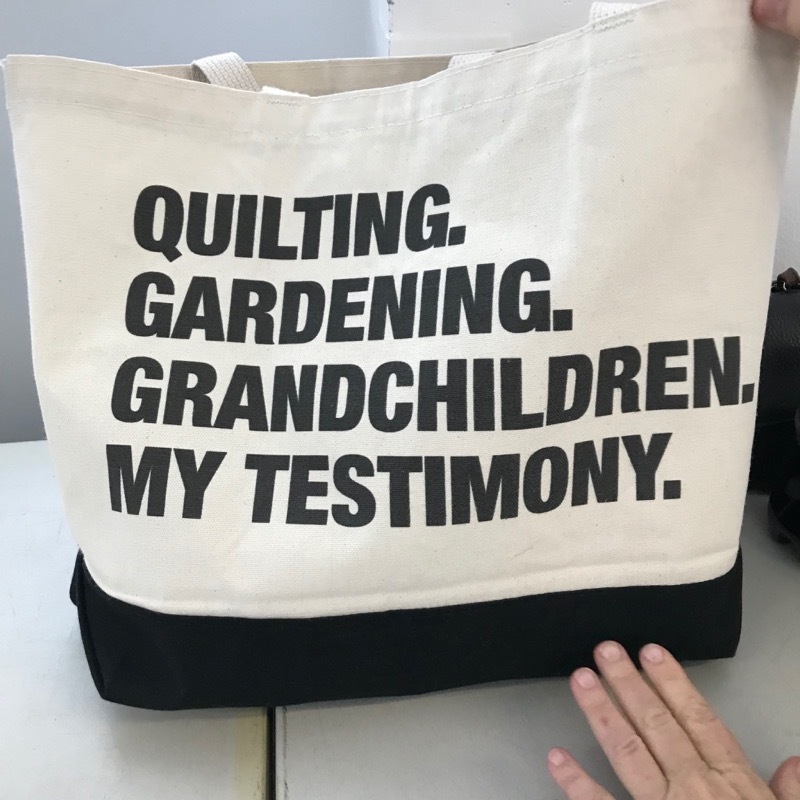 I have a lot of the quilts, plus the placards that tell about the quilts, up on my Instagram feed beginning here. Use the right arrow to advance through them, and I apologize again if you follow me on IG and I blew up your feed. 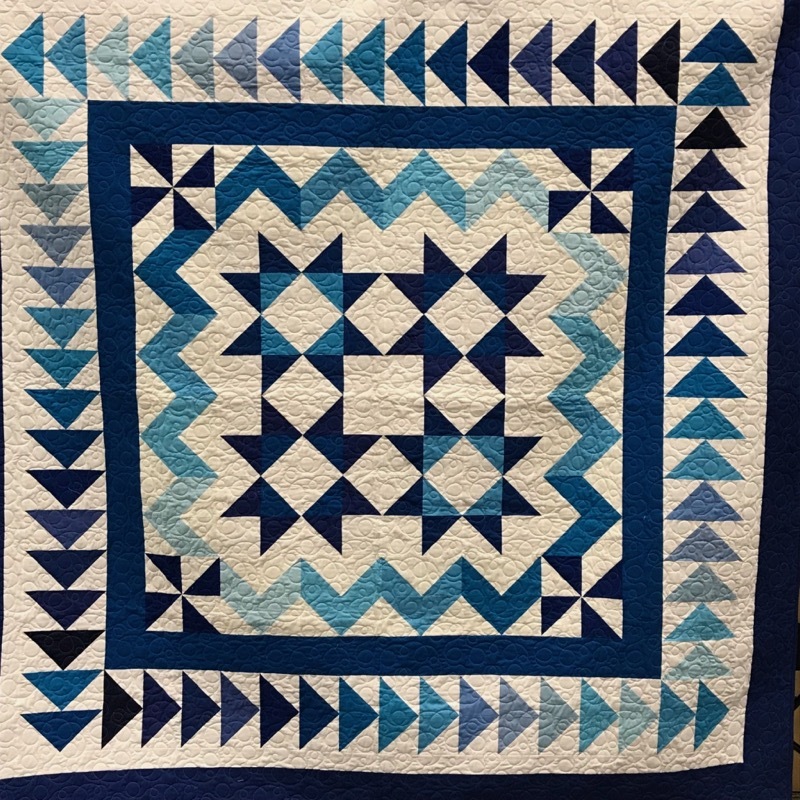 I had many favorites and wrote about them on Instagram, but I also kept looking at the quilting, trying always to improve my FMQ. …Caitlin’s baby shower to attend that evening. I was the gift scribe, and being the oldest of the bunch I needed a translation program that spanned several decades. For example, I would write “squeaky toy” and Caitlin would say “Thanks for the teether.” I would then line out “squeaky toy” and write down what she called the plastic giraffe. This happened over and over, and left me certain that I was waaaaaay past the child-bearing years. The language was so different, it was like a different world. 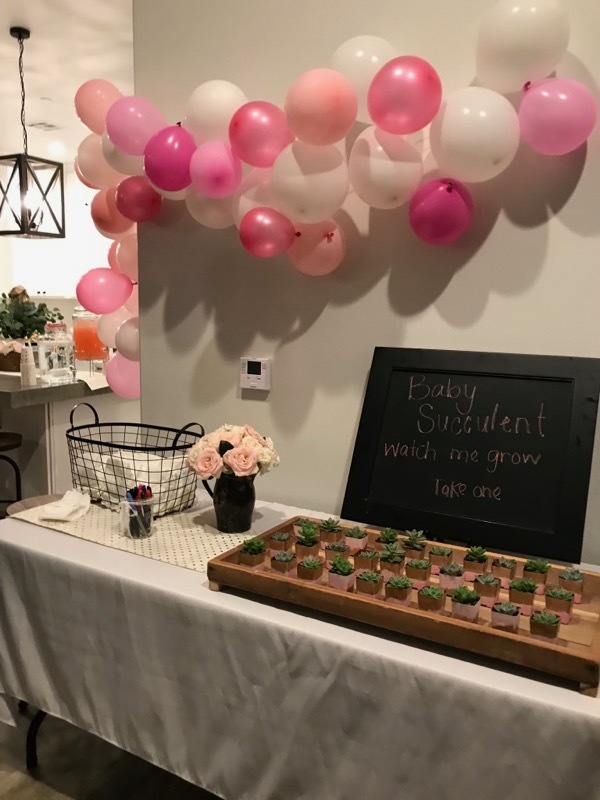 The favors were tiny succulents, the food was divine (I need to get the recipes) and we took a marker and wrote a message on the diapers in the wire basket, above — messages that Caitlin would read at those midnight diaper changes. Okay, back to the show. Friday: Lisa, Leisa and I took the Mystery Triangles Class from Jenny Doan. 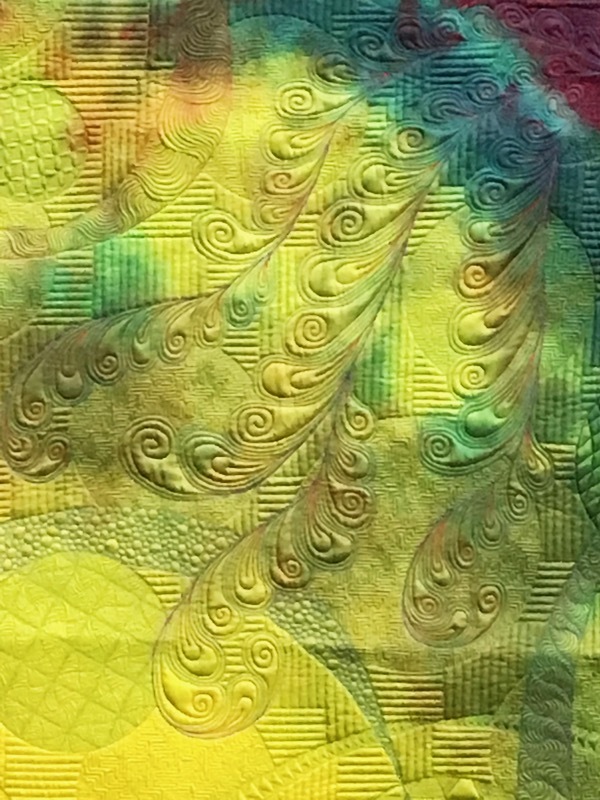 Another class where I chose it for the person teaching it, as Jenny Doan is fabulous. This was the most relaxed class, and I really enjoyed it. The quilt above is all the techniques/options rolled into one quilt. 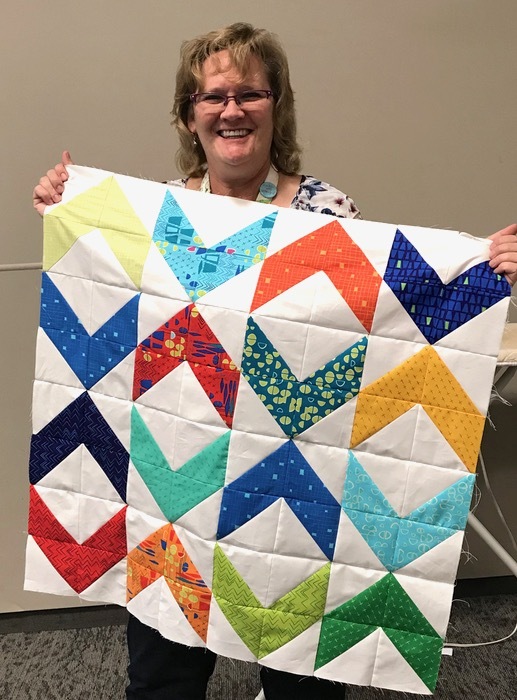 Lisa finished a baby quilt top, using Christa Watson’s new line of fabrics, that have a lot of wow-factor. Cute! We did some shopping, then headed over to El Torito. where our little quilt group gathered for our annual dinner. Some years we’ve been fewer in number, and some years we’ve been higher in number; this time Lisa’s friend Margaret from Idaho joined us (in the red). Then we all hightailed it back to the show, where we took in Jenny Doan’s Trunk Show that night. It was fun and funny and good to be there with everyone. Saturday: I walked all the vendors one more time, then about noon, Leisa and I left. Sunday: I had to pick up my quilts at 4:30 so I went early. 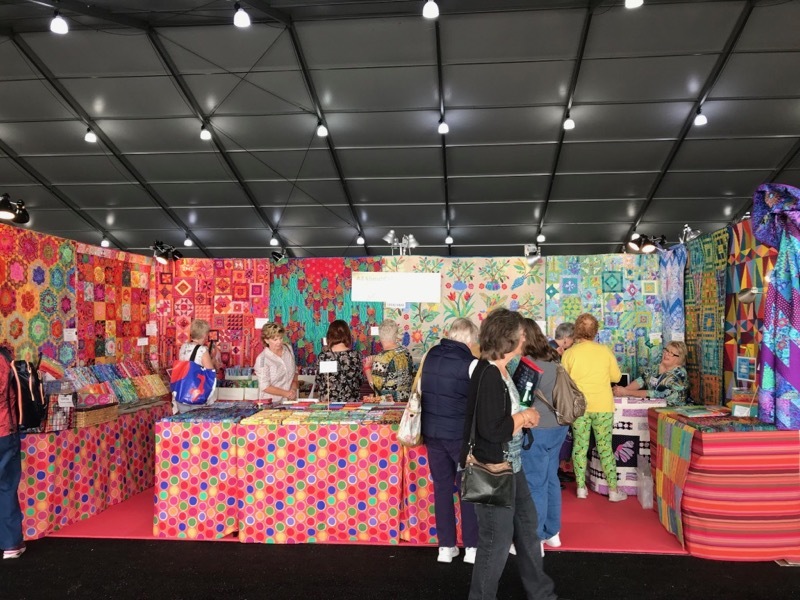 My experience has taught me that the show is pretty emptied out near the end, and I could walk the quilts and look at them one more time, taking photographs without any people in them. 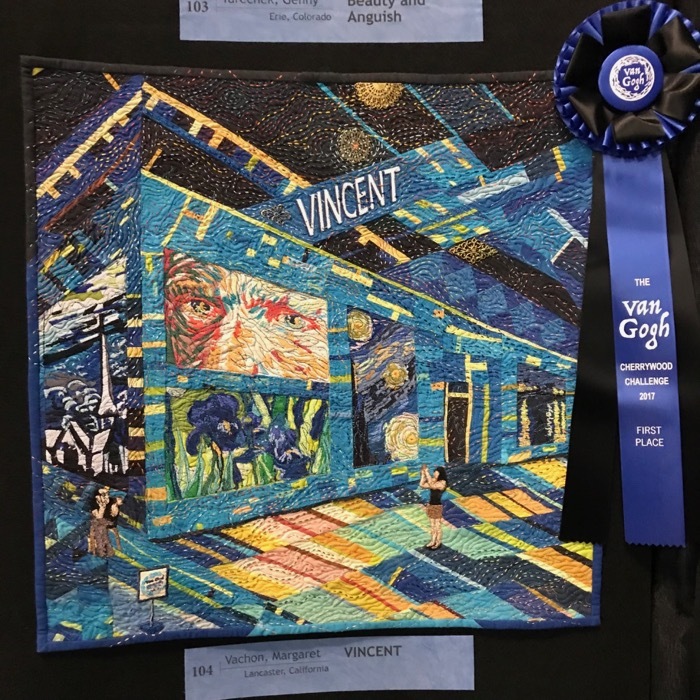 I re-visited the Cherrywood Fabrics booth with all the Van Gogh-inspired fabrics and snapped these two panorama shots (which distorts the photo–it’s really quite rectangular). Next year the theme is Prince, with purple fabrics, if you want to jump in. They’ve had three collections so far: Lion King, Wicked, and Van Gogh. I have loved them all. Click to enlarge the above two photos. The dates for next year’s Road to California are January 17-20, 2019. 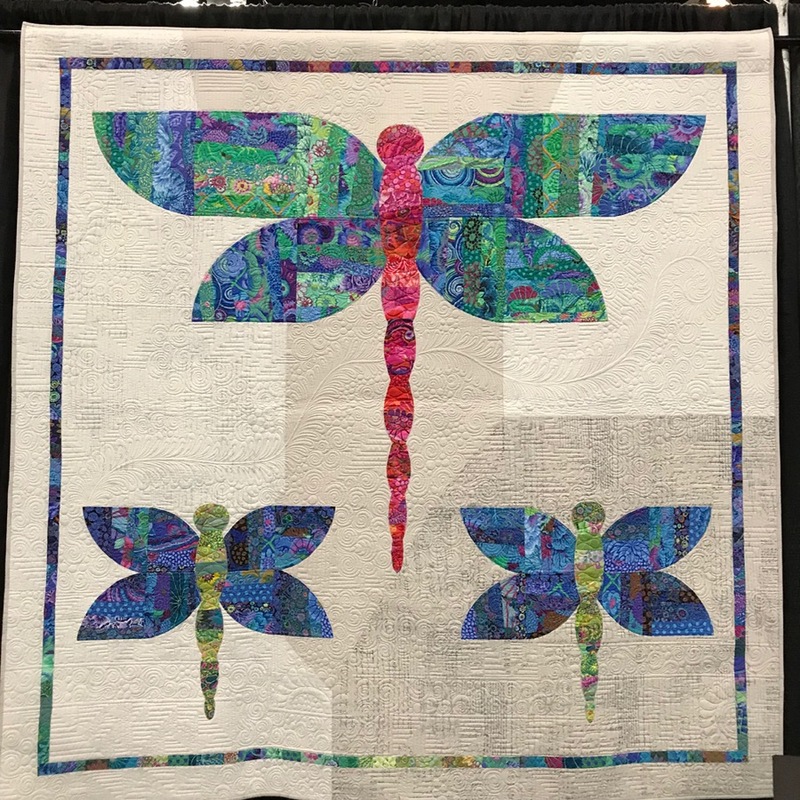 Make plans now to come to a terrific quilt show!